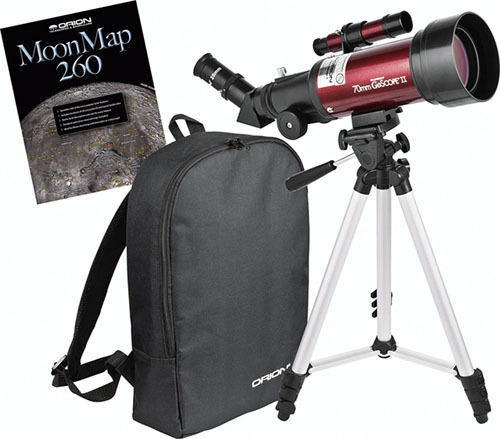 The Orion GoScope II 70mm Refractor travel telescope is a grab-and-go instrument for stargazers young and old. The included backpack and moon map in the Moon Kit are a nice bonus. Bright nebulae, galaxies and star clusters are all within your grasp. If you've always been interested in viewing the night sky from a new perpective, now is your chance. 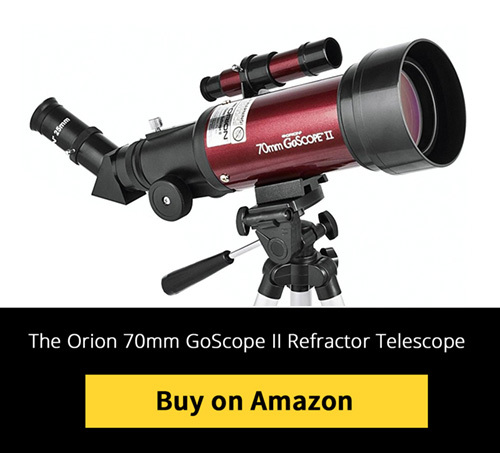 The Orion 70mm GoScope II Refractor offers beginners an affordable opportunity to enjoy stargazing. 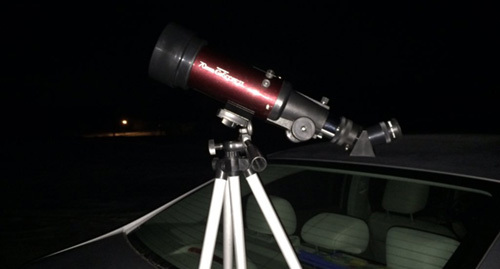 The best part about this kit is that it's affordable price tag means that even casual night sky observers have a chance to take a closer look. It is important that your first astronomy experience be a positive one, to ensure that your passion for astronomy can develop. Stay on top of the latest astronomy events at EarthSky Tonight. 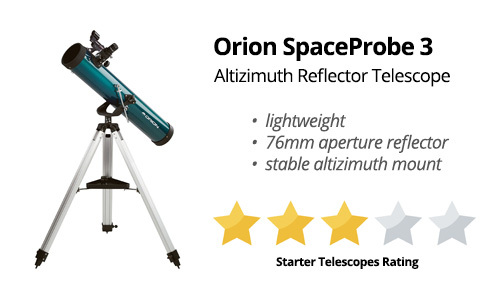 This is a great beginner telescope to bring with you to the cottage or campsite. Travelling to dark skies is important if you wish to observe some of the fainter deep sky objects such as nebulae and galaxies. The 400mm focal length means wide field views of star clusters such as the Pleiades will be completely within your field of view. Use the provided 25mm and 10mm eyepieces to increase the power for a closer look. The Moon will look even better, as you scan across the lunar surface enjoying all of the detailed craters. This is a view of the moon like you have never seen before! The ultra-portable Orion GoScope II is small enough to easily pack with the rest of your other camping gear. This telescope doubles as a terrestrial spotting scope during the daytime. This makes the GoScope perfect for enjoying wildlife up close. The entire kit can be set up in a number of minutes. Show your kids a view the moon like they have never seen before. 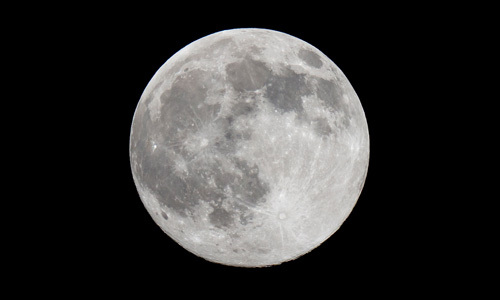 The 70mm achromatic lens excels in sharp images of the moon and planets. Take a trip across the summer Milky Way to find the jewels of the night sky. Bright nebulae, galaxies and star clusters are all within your grasp. Can you take pictures through this telescope? Yes, you can take pictures of the moon and bright planets like Juipter using your smartphone. Photography through a telescope is known as astrophotography, and it is a popular form of night photography. You may need an adapter to steady your phone to the eyepiece. It will be tricky, but photos are possible! The Orion SpaceProbe 3 includes the Orion EZ finder II finder scope, which is great for locating objects in the night sky. This reflector design lets in more light than the GoScope II, but does not come with a travel kit, and is a little more expensive. This is a good option if you are looking for a little more aperture in your telescope. 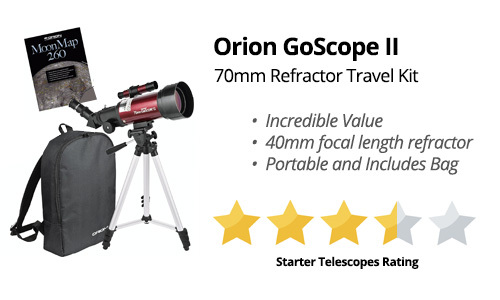 The Orion GoScope II 70mm Refractor offers an incredible value, at less then $100 US. The portability, included accessories, and afforable price tag make this an attractive choice for your first telescope. The Orion StarBlast has the largest aperture of the models compared. This means that this telescope lets in more light, and provides deeper views of fainter objects. 4.5" is enough to obseve brighter galaxies such as Andromeda and M81 and M82. 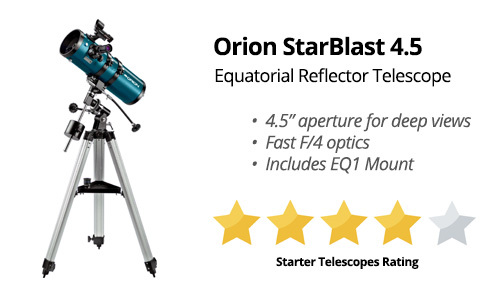 This telescope also includes the EZ Finder II finder scope and an EQ1 mount. All of this comes with a steeper price tag.